The steady beating rang out across the rural countryside. The year was 1863. 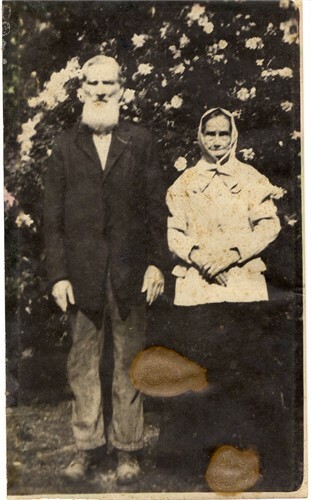 My great-great-great-great grandparents lived deep in the heart of the Confederacy, somewhere in the piney hills of Catahoula Parish in northern Louisiana. They were dirt poor, just simple farmers trying to work hard just to get by, certainly not wealthy land and slave owners. The man of the house, George Washington Allbritton, had gone off to fight in the Civil War. He left his wife, Sarah, behind to care for their 12 children. Early on this cold December morning, Sarah awoke to a noise. Over and over, the sound continued, steady as a heartbeat. And the one thought racing in Sarah’s mind was that this must surely be the sound of Yankee drums. Sarah quickly woke the children. Hurry with your chores! Milk the cow and gather the eggs, and come right back inside! Sarah tried not to panic, but the drumming continued as she cooked their biscuits and bacon for breakfast. As they bowed their heads over the meal, Sarah silently added an additional prayer that the Yankees wouldn’t come by their house today. By mid-morning the drumming sounded louder. Sarah instructed her children to hide their meager possessions. Wrap the family Bible in the quilt made by my mother, Maggie. Then you take it and bury it in the garden, Tom. Take all our corn meal, flour and dried salt pork, and hide it in the barn underneath the wagon and cover it with some hay, Ben. Hurry children! We don’t want the Yankees to take our things! Shortly after noon, Sarah was feeling frazzled from the constant pounding of the drums. Hardly a minute passed without hearing the beat reverberating throughout the hills surrounding their home. She sent the older boys to turn the old milk cow and the chickens loose. We will not give the Yankees any of our hens for their supper tonight! Later in the afternoon the sounds of a wagon could be heard, coming over the road. Swiftly, Sarah rushed all the children, from the youngest to the oldest indoors. She stood just inside the doorway of their small log home. Finally, after an eternity, a horse and wagon came into view. What a relief! It was just her brother Martin. Perhaps he was already on his way over to warn her and ensure that she and the children were safe from a Yankee raid. Sarah ran outside and flagged him down. But to Sarah’s astonishment, Martin was unaware of any Yankees marching in the area. In fact, he hadn’t heard any drumming noises all day, though he could certainly hear the steady beat now! So Sarah and Martin took a walk around the farm, and there behind the barn they found an overturned barrel. Trapped underneath was Sarah’s Yankee drummer … a chicken trying to peck it’s way out. As the sun sank low, Sarah sighed a sigh of relief as she stood in front of the stove to cook their supper. She sent the girls up to the garden to retrieve the family Bible, wrapped in her mother’s quilt, and the boys went out to find the old milk cow. And later that evening, they bowed their heads and with thankful hearts said grace … before they ate their Yankee drummer for dinner! The above story is a mostly true account of a family story from my great-great-great grandparents, George Washington Allbritton and his wife Sarah Cassells Allbritton. Photo of George Washington Allbritton and his wife Sarah during their later years of life. This version of the story was written by my son Joel, who wrote it to be used as a narrative speech in a class he was taking last fall. He did use some writer’s liberties and changed a few of the details. For example, when George Washington Allbritton left his wife Sarah to go fight in the war, only 2 of their children had been born. The remaining 10 were born after the Civil War had ended. 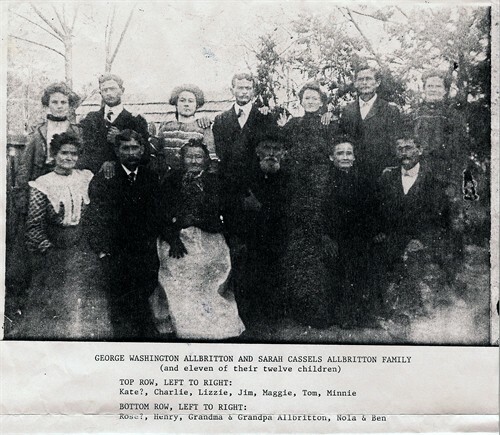 George Washington Allbritton and his wife Sarah with 11 of their 12 children. We descend from their daughter Minnie, who is the last woman on the right on the back row. Additionally, we don’t know if Sarah’s brother Martin came by to help her figure out it was a chicken under a barrel instead of a regiment of Yankee soldiers … but we do know that she did have a brother named Martin Van Buren Cassells. Other than those two details, the story is true. Sarah did hear a steady beating and hid much of their treasured items, before realizing the sound she heard was just a chicken beneath an overturned wooden barrel. Thanks! I’m glad you enjoyed the story, too!